Dangerous crossroads: Is Obama intent upon waging a military operation on Russia’s border prior to the end of his presidential mandate? This military onslaught could potentially create a fait accompli. Are these US deployments part of Obama’s “act of retribution” against Russia in response to Moscow’s alleged hacking of the US elections, which according to the director of National Intelligence James Clapper constitute an “Existential Threat” to the Security of the US. As we recall Obama on December 29th “ordered a series of retaliatory steps against Russia”. Is this a “fast-track” procedure on the part of the outgoing president, with the support of US intelligence to create chaos prior to the inception of the Trump administration on January 20th? Meanwhile none of this is front page news. The mainstream media is not covering it. Below is the report of the Donbass International News Agency report. Correction. A previous version of this text by the Donbass News Agency (translated from Russian) misquoted the original RT source: the figures refer to pieces of military hardware rather than tanks. The NATO war preparation against Russia, ‘Operation Atlantic Resolve’, is in full swing. 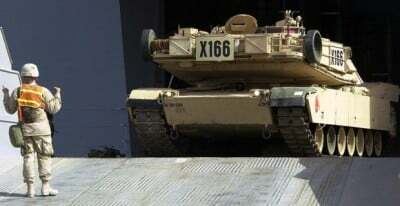 2,000 pieces of military hardware will be sent in coming days from Germany to Eastern Europe, and 1,600 US military hardware are deployed to storage facilities in the Netherlands. At the same time, NATO countries are sending thousands of soldiers in to Russian borders. According to US Army Europe, 4,000 troops and 2,000 military hardware will arrive in three US transport ships to Germany next weekend. From Bremerhaven, US troops and huge amount of military material, will be transported to Poland and other countries in Central and Eastern Europe. USA is sending to Russian borders 3rd Brigade of the 4th Infantry Division. Overall, more than 2,500 pieces of cargo are shipped to Germany, where those will be unloaded in the period January 6-8. US military material and troops will continue to Poland by rail and military convoy’s. Massive US military deployment should be ready by January 20. “Some 900 cars with military materiel will be transported by train from Bremerhaven to Poland. There are also about 600 pieces of freight that will be transported by train to Poland from the military training ground at Bergen-Hohne. Nearly 40 vehicles will travel directly by road from Bremerhaven to Poland,” told Bundeswehr press office. While NATO is preparing for war against Russia, Hodges turned everything upside down and accused Russia of preparing for war. “This does not mean that there necessarily has to be a war, none of this is inevitable, but Moscow is preparing for the possibility,” Hodges said.